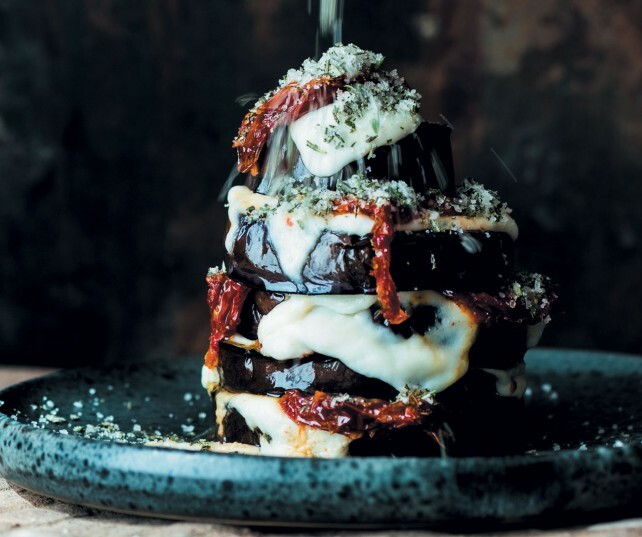 Fat slices of caramelised aubergine that are creamy in the middle, dripping with melted mozzarella and offer a flavour punch of sun-dried tomato. Add the show-stopping ingredient, rosemary salt, and you’ve got a vegetable dish from heaven! 1. Preheat the oven to 180˚C. Remove the tops and bottom stems of the aubergines and cut into slices of about 2cm – 3cm thickness. Sprinkle with the 15ml (1 tbsp) Khoisan Sea Salt and some cracked black pepper. 2. Heat a large pan over medium heat, add 25ml (5 tsp) of the olive oil and fry the slices from one aubergine on both sides, turning only once, until nicely browned. Add another 25ml (5 tsp) olive oil when turning, as aubergines absorb a lot of oil. Repeat with the second aubergine. 3. Place the aubergines on a baking tray, top with the mozzarella slices and bake until the cheese is nicely melted and the aubergines have a creamy centre, about 10 minutes. 4. To stack, place the largest aubergine slice at the bottom, followed by 1 or 2 sun-dried tomatoes. Repeat the process until the smallest slice is at the top and end off with a layer of sun-dried tomato. Return to the oven to warm through, 5 minutes. 5. Pull the rosemary leaves off the stalk and place on a wooden board with the 60ml (1/4 cup) salt. Chop it all together until the rosemary is fine and it is well combined. Sprinkle the stack with rosemary sea salt to serve. You can also mix your herbs – try half thyme and half rosemary.